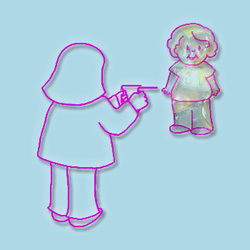 Here are a couple of ways that children can experiment with getting in touch with their energy field and how it works. Parents can have fun with these exercises too. By using energy sensing techniques children will easily understand that they are electromagnetic beings as well as a physical being. Have them create an energy ball between their hands. First help make your hands sensitive by rubbing them together quickly like you would to warm your hands up if they were cold. relax your hands and put the palms of your hands facing each other about 6 inches apart. Just leave them there for a minute, relax and what you feel between your hands. Slowly move your hands closer together. Then move them farther apart until you begin to feel something gently resisting the push and pull of your hands. This is the energy ball and with practice you might even be able to see it. Even if you don’t see it doesn’t mean it isn’t there. We can’t see radio waves, but if we turn on a radio we can hear them. We can’t see the satellite transmission to your TV, but when we turn on the TV we can see the picture. All energy works the same way. We need a transmitter and a receiver in order to sense how the energy is working. You can sense the energy field with your hands. Let your hands drop to your sides with the palms of your hands facing forward. Imagine that your consciousness is in your hands. Now walk towards another person and notice what you feel in your hands as you get closer. You can also create a tool to help you experience the layers of the energy field. This is very simple to make, but you might want to get an adult to help you. 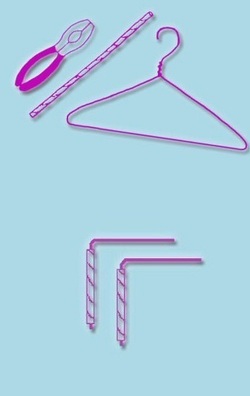 You will need a wire coat hanger, a drinking straw and a pair of pliers or wire cutters. Cut two length of coat hanger wire (about 10” long). Bend each wire so that it forms a right angle. Cut the straw in two lengths (about 4” long). Put one end of the bent wire in each straw. Hold the rods by the straws so the wire moves around easily without you controlling it. Now try walking toward another person again. Hold the rods out in front of you. The rods will come together when you have reached the densest part of the person’s energy field. Now step back and beam energy or love from your heart at that person for just a minute or two. If you are doing this with some friends everyone can beam energy at the person. Now try walking towards them again with the rods. Notice how quickly the rods come together. The energy you beamed increased their energy field! You can try doing this by thinking of something, which makes you very, very, happy and watch how your field gets even bigger and stronger. Then try thinking of something you don’t like and watch how small your energy field becomes. *This exercise shows you how positive attitudes keep your field bright and strong!